We will laugh. We will cry. We will sing and we will dance. Its golden stilettos, ripped fishnets, shoulder pads, and neon bobs. It’s Doncaster, 2009. Autobiographical, drag & storytelling. So imagine this. You are 14 years old and you are a drag queen. Its golden stilettos, ripped fishnets, shoulder pads, and neon bobs. It’s expression. It’s glamour. It’s power. It’s Doncaster, 2009. 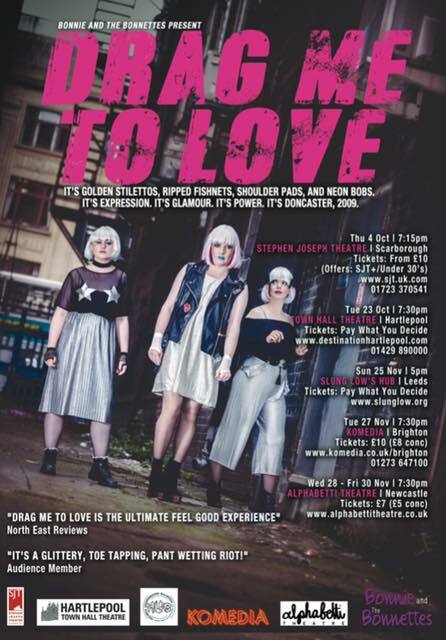 This autobiographical, three person show, combines drag performance with theatrical storytelling to build the world of Bonnie Love and The Bonnettes. Set against a backdrop of pop anthems and glitter we follow Cameron as he throws himself into a pair of 6-inch stilettos – meeting new people making both friends and foes. But not everything is as it seems and piece by piece the glamorous world of drag fades away. Created by Cameron Sharp, Hattie Eason, Becky Glendenning-Laycock, and Abbey Jones. Performed by Cameron Sharp, Hattie Eason, and Becky Glendenning-Laycock.